In this optics activity, learners explore why the sky is blue and the sunset is red, using a simple setup comprising a transparent plastic box, water, and powdered milk. Learners use a flashlight to shine a beam of light through the container. Learners look at the beam from the side of the container and then from the end of the tank, and compare the colors that they see. Learners also examine a narrower beam of light. Use this activity to introduce learners to the light spectrum, wavelengths, frequency, scattering, and how all this effects what we see in the sky at different times of the day. In this activity, learners observe as soap bubbles float on a cushion of carbon dioxide gas. Learners blow bubbles into an aquarium filled with a slab of dry ice. Learners will be amazed as the bubbles hover on the denser layer of carbon dioxide gas, then begin to expand and sink before freezing on the dry ice. Use this activity to discuss sublimation, density, and osmosis as well as principles of buoyancy, semipermeability, and interference. In this activity about electricity, learners produce a spark that they can feel, see, and hear. Learners rub a Styrofoam plate with wool to give it an electric charge. Then, they use the charged Styrofoam to charge an aluminum pie pan. Essentially, learners build an electrophorus (Greek for "charge carrier"). This resource also contains instructions on how to build a large charge carrier called a "Leyden Jar" using a plastic film can. In this activity related to magnetism and electricity, learners create a magnetic field that's stronger than the Earth's magnetic field. Learners use electric currents that are stronger than the field of the Earth to move a compass needle. The assembly is made using a lantern battery, heavy wire, a Tinkertoyă˘ set, and poster board and utilizes 4-6 small compasses and 2 electrical lead wires. 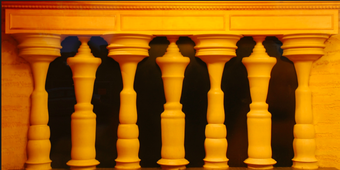 In this optics activity, learners discover that not all shadows are black. Learners explore human color perception by using colored lights to make additive color mixtures. With three colored lights, learners can make shadows of seven different colors. They can also explore how to make shadows of individual colors, including black. Use this activity demonstrate how receptors in the retina of the eye work to see color. In this activity, learners make their own heat waves in an aquarium. Warmer water rising through cooler water creates turbulence effects that bend light, allowing you to project swirling shadows onto a screen. Use this demonstration to show convection currents in water as well as light refraction in a simple, visually appealing way. In this optics activity, demonstrate diffraction using a candle or a small bright flashlight bulb and a slide made with two pencils. Learners will observe the diffraction pattern and learn that light has wavelike properties. In this activity related to magnetism and electricity, learners discover that a magnet falls more slowly through a metallic tube than it does through a nonmetallic tube. Use this activity to illustrate how eddy currents in an electrical conductor create a magnetic field that exerts an opposing force on the falling magnet, which makes it fall at a slower rate. This activity guide also includes demonstration instructions involving two thick, flat pieces of aluminum to illustrate the same principle. In this activity about electricity, learners explore how static electricity can make electric "fleas" jump up and down. Learners use a piece of wool cloth or fur to charge a sheet of acrylic plastic. Then, they observe as tiny bits of Styrofoam, spices, ceiling glitter, or rice (aka "fleas") jump up to the plastic and then back down. In this fun optics activity, learners explore principles of light, reflection (mirrors), and perception. Learners work in pairs and sit on opposite sides of a "two-way" mirror. Both partners vary the amount light illuminating their faces. As they adjust the light, they begin to see themselves gradually assuming aspects of their partner's features, so that their image becomes a "composite" person. This activate guide includes instructions on how to build a two-way mirror. This highly visual model demonstrates the atomic theory of matter which states that a gas is made up of tiny particles of atoms that are in constant motion, smashing into each other. Balls, representing molecules, move within a cage container to simulate this phenomenon. A hair dryer provides the heat to simulate the heating and cooling of gas: the faster the balls are moving, the hotter the gas. Learners observe how the balls move at a slower rate at lower "temperatures." In this activity about light and refraction, learners discover how a lens creates an image that hangs in midair. A large Fresnel lens creates upside-down images of distant objects and right-side-up images of nearby objects. Learners can locate the upside-down images by using a piece of white paper as a screen. The right-side-up images are harder to find. Activity includes detailed explanations and diagrams to explain how the images are created. In this activity, learners explore liquid crystals, light and temperature. Using a postcard made of temperature-sensitive liquid crystal material, learners monitor temperature changes. By observing these changes, learners show that dark materials absorb and reemit the energy contained in light more readily than light-colored materials. Learners can also distinguish energy absorbed and reemited by radiation, convection, and conduction by comparing the behavior of black, white, and silver objects. This resource guide includes detailed explanation of the phenomenon and background information about liquid crystals.